Bohemian Earth: Handcrafted Jewelry: I'm back! I've been away for far too long, but, alas, studying for and completing my PhD exams took precedence over making jewelry. The good news is that I passed all eleven hours worth of my exams (the last exam was just this past Monday the 27th), and, to celebrate, I've made three new necklaces that are full of spring colors ! I'll post these lovelies within the next week and hopefully I'll have a couple of pairs of earrings to share as well. For now, here are a few preview shots! 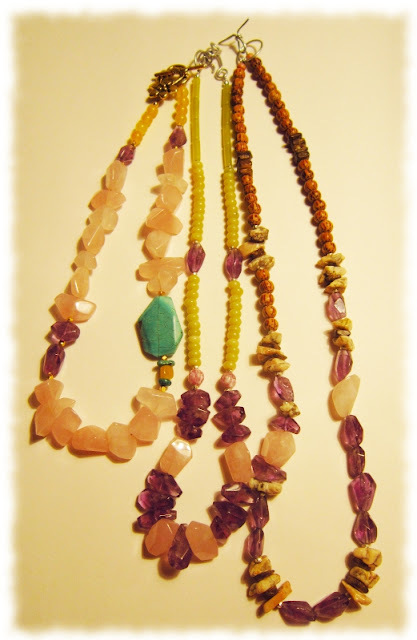 These necklaces feature rose quartz, amethyst, turquoise, olivine jade, and much more! A length for every occasion!